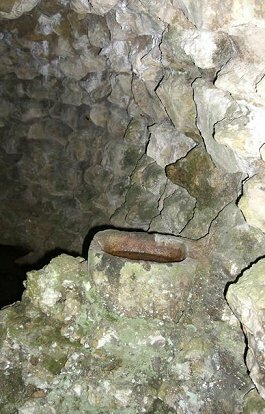 Department Aube, region Champagne-Ardenne, just outside the town in her chapel in the forest La Garenne des Comtes, 12th century, about 6 inches. Chapel open from Pentecost Sunday to the end of September, 3-6:30 p.m. Although Our Lady of the Oak is not actually called a Black Madonna, I include her in this index for two reasons: 1) because she perfectly matches so many characteristics of Black Madonnas. 2) in gratitude to people like Johanna Klapper, who brought this exquisite shrine to my attention and provided all the photos and most of the information. I definitely want to encourage such behavior! This is a Pieta type Madonna, i.e. the sorrowing mother with her dead son draped across her lap, like the Black Madonna of Telgte. The legend recounts that a young shepherd found this Madonna in the hollow of an Oak and took her home. But, like so many Black Madonnas, she wanted to be venerated in nature, at the exact spot where she had chosen to appear. (*1) So she kept returning miraculously to her tree, next to which there is a healing spring. Having thus asserted her will, her fame spread quickly and the faithful began gathering at her shrine in nature. That's the Christian story at least. 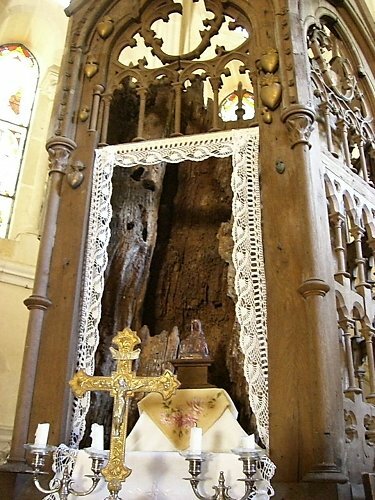 Robert Régor, author of the website le blog vivrevouivre claims that the combination of sacred tree and sacred well, plus a Madonna insisting on being honored there, point to a pre-existing Celtic holy place. He is probably right. Both the sacred tree and sacred spring are typical nature companions of Black Madonnas that point to the function of the Dark Mothers of baptizing pre-Christian nature shrines. Other Black Madonna tree shrines listed in this index are: Neuerburg, formerly Telgte, Neukirchen-beim-heiligen-Blut, Foggia, Antipolo. Yes, Pagan holy sites in nature were Christianized, and not only by means of Black Madonnas. The sacred feminine as a whole was connected to the earth. Other French Madonnas with the title Our Lady of the Oak are found in Le Mans, Scey-en-Varais in the diocese of Besançon, Sablé-sur-Sarthe, and Goersdorf. (*3) Other sacred Mary-trees not necessarily of Black Madonnas, are found in Germany and Poland. (*4) What if this sanctification of nature really was the will of the earth who is the mother of all of us? Notice that the pool of healing water forms a spiral, an ancient symbol of the Goddess. Next to it a small basin is hewn out of the rock, probably for drinking and blessing oneself. The gate to the pool of healing water. "Go to the pool at Siloam. What probably further contributed to the fame of this Madonna is that Bar-sur-Seine lies on the pilgrimage path to Santiago de Compostella and near the Knights Templar commanderie of Avalleur. It is said that both St. Bernard of Clairveaux (1090-1153) and King Louis XI (1423-1483) came to the sacred Oak-Madonna on pilgrimage. *1: For similar stories see: Vassivière, Costa Rica, Dorres, Lluc, Montserrat, Nuria, Lord, Kursk. *2: There is a concordance where you can search the Medjugorje messages for key words. Here are 2 more quotes: August 25, 1999: "Dear children! Also today I call you to give glory to God the Creator in the colors of nature. He speaks to you also through the smallest flower about His beauty and the depth of love with which He has created you. Little children, may prayer flow from your hearts like fresh water from a spring. May the wheat fields speak to you about the mercy of God towards every creature." Message of July 25, 2001: "Find peace in nature and you will discover God the Creator whom you will be able to give thanks to for all creatures; then you will find joy in your heart." *4: E.g. a Polish church is dedicated to a Mary-linden-tree in Swieta Lipka near Reszel on the road to Ketrzyn.